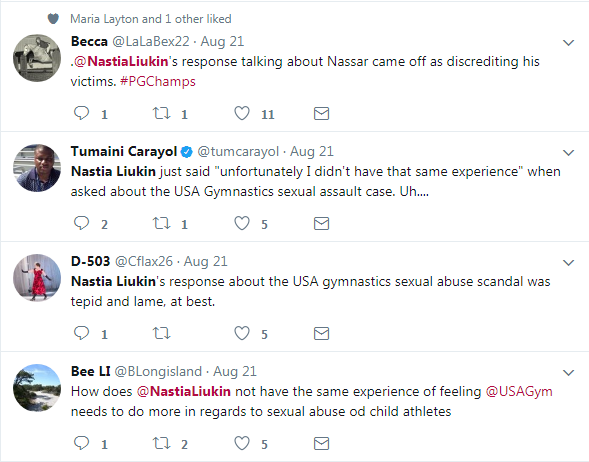 Gymnastics fans were left very disappointed with former Olympic gymnast Nastia Liukin following her response to a question regarding USA Gymnastics sexual abuse scandal. 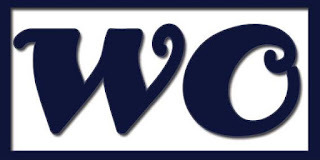 Liukin, who now works as a sports commentator for NBC, was asked by Al Trautwig for her opinion about three time Olympic champion Aly Raisman calling out the organization for its handling of the sexual abuse scandal, during the broadcasting of the second day of the P&G championships. "Well to be honest I had a different experience with USA Gymnastics and had nothing but an incredible career," said Liukin. "And you know [un] fortunately don't have that same experience but they definitely have a huge platform so hopefully they will take that platform and put it to good use." Fans, who were watching the championships, voiced their frustration at the former gymnast's response. 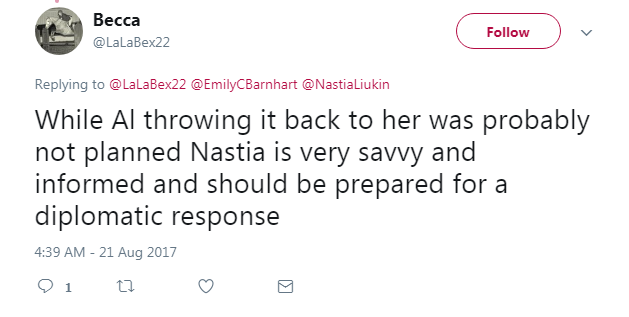 "@NastiaLiukin's response talking about Nassar came off as discrediting his victims. #PGChamps"
"Nastia Liukin's response about the USA gymnastics sexual abuse scandal was tepid and lame, at best." 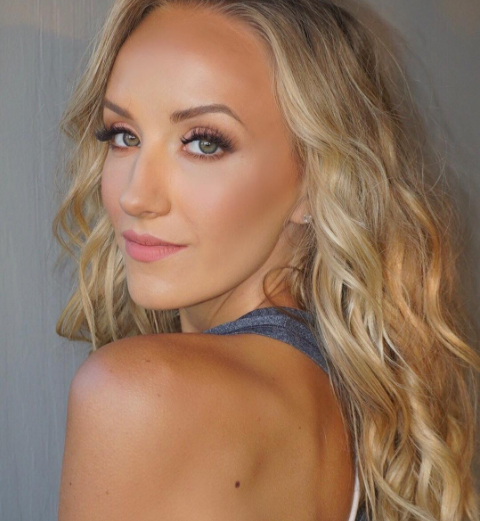 "How does @NastiaLiukin not have the same experience of feeling @USAGym needs to do more in regards to sexual abuse od child athletes"
"Hoping @NastiaLiukin will clarify her comments on the USAG sexual abuse scandal. Unfortunately not her experience? Cringe. #PGChamps"
"Very disappointed in comments by @NastiaLiukin re: @Aly_Raisman's statement on the sexual abuse @USAGym gymnasts suffered. #PGChamps"
"Can't believe she basically has no opinion about young gymnasts being sexually molested." "Disappointed and disgusted in her response hope that @NBCSports and @NastiaLiukin will clarify." 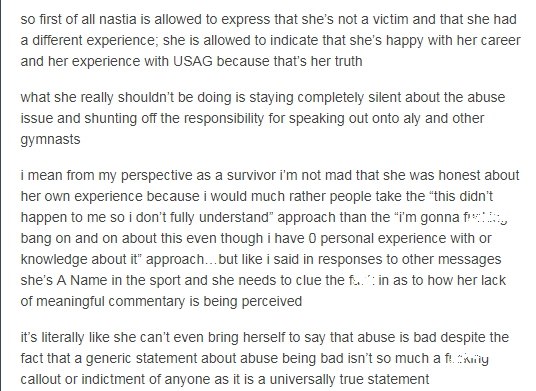 "Shame on @NastiaLiukin & @NBC for "not my experience" commentary - there is damning evidence that should not be minimized. #PGChamps #USAGym"
While others felt that she is in tough position considering that her father 'Valeri Liukin' is the current coordinator for the women's national gymnastics team, however, they felt that she could have had a better response. On Tumblr, a fan demonstrated that Nastia had an extra amount of protection when she was a competitive gymnast since her dad was always with her adding that most gymnasts do not have such luxury and that they wish she could be more understanding of the other girls' experience. While another said that she has every right to express that she was never a victim but since she is an A listed athlete, she should not stay silent and speak up against the horrific abuse. Raisman no longer follows her on Twitter. Last March, the 2008 Olympic all around champion said she was shocked when she heard about the sexual abuse allegations against Larry Nassar explaining that she had nothing but a positive experience with USA gymnastics and that every encounter she had with him was professional. She also said that she has never heard of other gymnasts being abused by him during her career. However, she sent her thoughts and prayers to all gymnasts and parents who were affected by this.